And after the last two games, he would certainly know. Dos Santos scored four goals and added three assists last week and Tuesday was selected MLS Player of the Week. 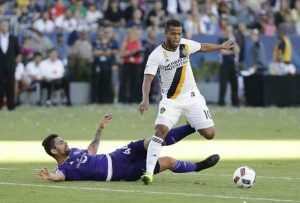 Dos Santos had two goals and an assist in a 3-3 draw against Chicago Wednesday and two goals and two assists in Sunday’s 4-2 victory over Orlando City SC. So far this season, dos Santos has scored 14 goals and added 11 assists. This entry was posted in Galaxy and tagged Giovani dos Santos by Damian Calhoun. Bookmark the permalink.